Prefect for making existing glass obscure for privacy. Our design team is able to copy most company logo’s and fonts. While sandblasted glass can create the desired frosted or etched effect on glass for interior design and privacy, it has the downside of being permanent and expensive as a retrofit solution. It’s also proven itself to be extremely difficult to maintain since fingerprints and other stains can be virtually impossible to remove. 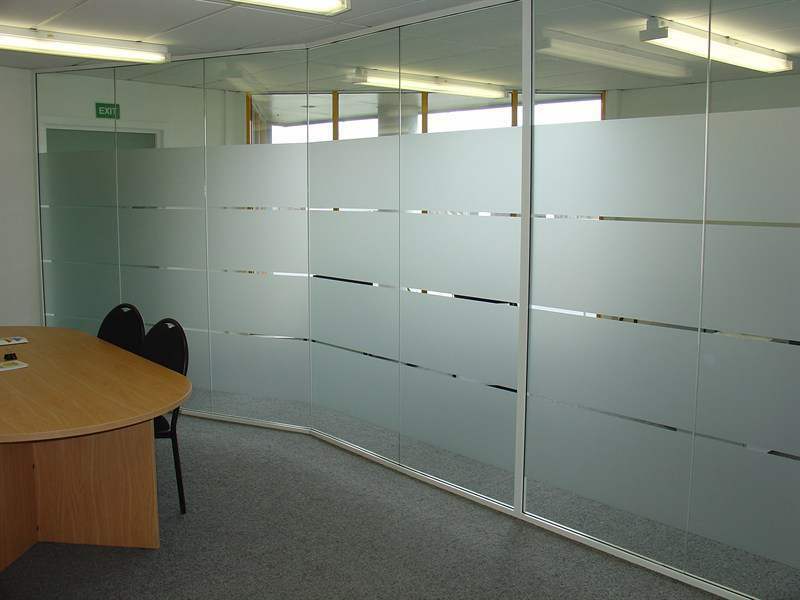 Sandblast film emulates the look of sandblasted glass but is easier to maintain and are far less expensive. Sandblast window films have the look and feel of frosted glass and can be custom cut to almost any pattern and applied on-site at a significantly lower cost sandblast films, an old design or logo can be easily removed and replaced with a new one as often as you wish. Cut and made in to squares and circles for security on glass panels and doors. These manifestations are self adhesive and suitable for internal application and are very easy to fit. They are durable to moisture, have a scratch resistant coating and once installed are maintenance free and easy to clean. Did you know by law all public buildings with glass entrances, glass partition screens etc. must have manifestations installed.